Sequel to the wildly popular GrandChase is available on PC and mobile. It’s fair to say the original GrandChase was a phenomenon. Initially released in 2003, GrandChase was played by 20 million people in 10 different countries over the course of its lifespan. Featuring a blend of deep storytelling and colourful, kinetic action, the Korean action-RPG saw players join the band of adventurers known as the Grand Chase, venturing into unique player-created dungeons on their quest to defeat the evil sorcerer Kaze’aze. Now, the sequel to GrandChase—Dimensional Chaser—comes to PC and Mobile with a deeper, more tactical battle system and a truly immersive storyline that picks up where the original left off. Dimensional Chaser sees a return to the action-packed combat that made the original such a success. This time around, however, players can expect an even more complex and rewarding experience. 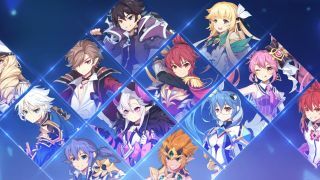 In Dimensional Chaser, the heroes of the Grand Chase band together in teams of up to four characters. Together, these characters fight enemies using a unique “Gather and Slay” mechanic. Rather than battling enemies individually, the strength in your party lies in powerful AOE attacks and an intuitive directional skill system. Hence, characters must work together to pull and crowd enemies into tight-knit groups, then slay them simultaneously by unleashing a barrage of devastating abilities. Controlling your party is straightforward, with a simple click and drag system for movement, and an intuitive menu for selecting spells and abilities. Another new feature is that characters are now split into five different classes, namely Assault, Tank, Ranged, Mage and Support. Creating a balanced party is key to victory, as each character has their own set of passive and active skills. Lass, for example, is a half-human, half-demon Assassin who can charge at enemies and slash through them with his “Laser Cutter” attack, while his “Assassin’s Instinct” ability increases the critical damage of other party members. Rin, meanwhile, is a Healer with the ability to morph into “Light” and “Dark” forms. The former heals allies upon a critical attack, while the latter decreases ally cooldowns, enabling them to get back into the fight quicker. Dimensional Chaser sees all 19 of GrandChase’s original characters return, with a total of 70 heroes available to collect throughout your adventure. The story of Dimensional Chaser focusses on Kyle, an aspiring swordsman, and Cindy, a novice Mage. Apprentices of a powerful wizard named Kassias Grandiel, the pair embark on a mission to seek out several members of the Grand Chase who went missing after a climactic battle against a group of demons known as the Asmodians. Grand Chase: Dimensional Chaser is a free-to-play game, with the emphasis on free. Characters a ranked in a hierarchy of power, ranging from B, A, S, with the most powerful Grand Chase members being labelled SR. Although characters can be purchased outright, you don’t need to pay to enjoy the game. Players can unlock mighty SR characters in numerous ways. For example, simply logging in every 28 days will provide players with Hero Summon Tickets, letting them acquire SR-ranked heroes. Furthermore, new players can unlock an SR ranked heroes by playing the Level-up adventure event, and the Mandragora’s Magic Summon Available to all new players, completing these events within 28 days will offer the chance to unlock SR-ranked characters. Characters can also be unlocked via opening special Diamond Chests and by spending Guild Points, which are earned by completing daily and weekly missions. All-told, Dimensional Chaser is a true sequel to GrandChase, retains the vibrant, colourful art-style and spectacular battle effects of its predecessor. Characters can slice enemies with powerful whirlwind attacks, and call down devastating meteor showers onto their opponent’s heads. Over the course of your adventures, you’ll do battle with all-manner of opponents, snarling orcs, robotic hounds, and towering bosses. At times, players will battle against as many as 100 enemies at once. As you progress, your characters will evolve into increasingly powerful forms, going from keen student to Arch Mage, novice fighter to Sword Saint. GrandChase is available to play on Android and iOS, but can also be played on PC via the BlueStacks App, enabling play with keyboard controls and multi-instance functionality. Collect your heroes and prepare for battle in the most reward free-to-play game ever!